We originally drove through Camden at 4 a.m on our way to Acadia National Park, so we can’t blame the town for looking a little sleepy at that hour. But even then, we knew this was a place we wanted to return to for further exploration. 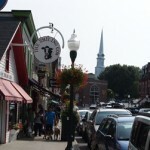 Maine is full of character, and Camden, on the Penobscot Bay wears that character like a fashionable hat. This adorable harbor town is lined with cute shops, restaurants and encircled by one of the most sparkling bay filled with stunning sailboats tended to by anxious sailors who seem to have jumped right from the pages of an L.L. Bean catalog. On this Labor Day Sunday, Camden was packed for its annual Windjammer Festival. We had to hunt quite a while to find a parking spot – nearly a half a mile from downtown. We had arrived at around 1 p.m. and we were starving – I specifically had a hankering for fish and chips. We first filed into Village Restaurant but after 10 minutes waiting for a waitress, we decided to pop over to Cappy’s Chowder House. And, boy we are glad we did. We grabbed two seats at the bar and quickly ordered two regional craft beers. After much debate, we finally decided to split a haddock sandwich after the couple next to us raved about it being the absolute best fish sandwich she had all summer. High praise from a New Yorker for sure! She did not steer us wrong. The sandwich was absolutely delicious – deep fried in “Downeast” style, the fish was soft, smooth and buttery. The tartar sauce was also very scrumptious. We hopped down to the harbor to watch the Build-a-Boat race. The race is designed for children, but has no age limitations as proven by one couple who already had their boat on sale (for $3000 or a case of beer) Always the gamblers, we of course picked our horses, quickly ensuring that they wouldn’t win, and true to form, they did not. We sat along the shore, soaked in the sun and watched them row their hearts out in barely sea-worthy vessels, one quickly sank and nearing the finish line, another tipped and dunked the pilots in the drink. We made our way through the cute gift shops filled with lobster and moose trinkets. This is without a doubt the perfect way to spend time in Maine – blue skies, an Ocean bay, sailboats and a festival. We could definitely see ourselves settling here, or at least saving up for a summer cottage! These cute harbor towns continue up and down the coast, our advice? Stop, and pick one we’re sure you won’t regret it. Friday Thirteen came in second. This one’s for sale – $3000 or a case of beer. Amazing waterfall in the heart of the Bay.